In an earlier post, you got the low-down on how to find the right tone for an eLearning course. But writing in the tone that resonates with your audience is not just about doing one thing right. It starts from understanding your learners to identifying the language and the emotions that appeal to them. The tone you choose will inform all of your written copy, including instructions, feedback messages, scenarios and stories. You have to not only be authentic but also maintain a consistent tone throughout the course. For this, you need a guide, a checklist of sorts, that will help you be on track. Call it the Tone of Voice Guide. 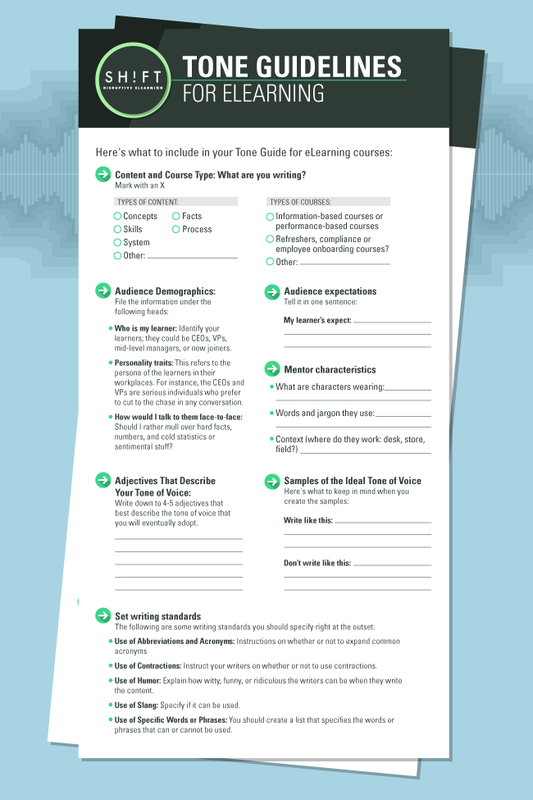 This guide will set the ground rules for how you should write in your eLearning course, keeping every screen and learning activity consistent from start to finish. Needless to say, the type of content you will cover in your course determines the tone of voice. For instance, explaining complex technical processess demand that you write in a straightforward manner. It is a good practice to use short and simple sentences. Learners should be able to focus on understanding the concepts or processes you have described without getting distracted by long and winding sentences, jargons, complex words, unfamiliar phrases and/or references, and unconventional uses of words. The type of course also determines the tone of voice. For instance, you can adopt a slightly informal tone for a refresher course or a sales onboarding course and reserve your matter-of-fact writing style for technical documents. 2) Audience Demographics: Who are you talking to in this course? How do you address your teachers? Do you strictly mind your (verbal) P's and Q's when you are amongst your best buddies? How you speak and the words you use depend on the company you are with. It is no different in the eLearning sphere. The tone of voice you adopt in your courses should be determined by target audience demographics. Who is my learner: Identify your learners; they could be CEOs, VPs, mid-level managers, or new joiners. Personality traits: This refers to the persona of the learners in their workplaces. For instance, the CEOs and VPs are serious individuals who prefer to cut to the chase in any conversation. The straight-out-of-college new joiners usually have less serious demeanors. How would I talk to them face-to-face: The CEOs, VPs, and the managers are busy people. They are accustomed to number-crunching and would rather mull over hard facts, numbers, and cold statistics than read sentimental stuff. You should pepper a course for these people with charts and tables that appeal to their analytical nature. Reserve your appeals to passions and sentiments for the younger new joinees. Learners don't just expect you to dump facts and numbers on them. They may expect you to take up their problems, provide solutions, and reassure them that they will benefit from your tips. If you are expected to play the role of a confidante and a mentor, you have to adopt a tone that is inspiring to read. Your learners may expect you to take charge and lead by example, especially when it comes to learning new skills or using new products. In such cases, you have to write in an authoritative tone. You have sat for hours on end to envision a mentor or a character, and your graphic artists have spent hours on the drawing board to give him a realistic look. Now you have to ensure you write in a tone that befits the mentor. For instance, if your mentor is clad in Louis Philippe, sports steel-rimmed glasses, and looks every inch a corporate honcho, you have to make him mouth lines that sound natural to his persona—matter-of-fact, urbane, and suave. A mentor with a guy-next-door image will, however, have the hail-fellow-well-met demeanor and will speak informally, with dashes of humor thrown in. Use a tone that aligns with the characters in the course. Make sure you are defining what characters on screen are wearing, the context in which they operate, and the words and jargon they use. In this section, you will finally nail down the tone of voice you will adopt for the course. Use adjectives (as many as possible) to describe the tone. Once you have an exhaustive list, boil down your essence down to 4-5 adjectives that best describe the tone of voice that you will eventually adopt. Then, you can use them as a quick guideline when you’re courses. Doing this has an extra bonus too: if you have a large development team, it can help the course maintain a consistent tone among the different members. For instance, if you have listed "commanding," "authoritative," and "insistent" in your list, keep just "authoritative" in your final list. You may use all the adjectives in the world to describe the tone, but a single writing sample illustrates the ideal tone of voice in the best way. When you create the sample, also list the no-no's of using the tone. Provide examples of the tone to use. Explain how you want the audience to feel after they have read through the course. For instance, you may want them to feel assured, so your mentor has to speak like someone who knows what he is talking about (read: lots of action verbs, no passive language). Provide guidelines about the tone not to use. For instance, you may want to clarify that the tone should be "informative but not preachy" or "friendly but not frivolous." Provide examples of the tone to use. For instance, find a text that sounds just like you want to sound for this course, and include it as a sample. Set style rules. For example, instead of ‘Course objectives’ you could say ‘What’s up next’. Whatever be the tone of voice you use for the course, you have to also lay down a list of best practices. These guidelines will help you or the other writers on your team to be consistent. Language of Instruction: This could be U.S. or U.K. English or any other that you would write in. Use of Abbreviations and Acronyms: These guidelines should include instructions on whether or not to expand common acronyms like UNICEF or WHO and a list of abbreviations that can be used. Use of Contractions: Instruct your writers on whether or not to use contractions. Use of Humor: If you intend to use humor in your course, explain how witty, funny, or ridiculous the writers can be when they write the content. Use of Slang: Specify if it can be used. Use of Specific Words or Phrases: You should create a list that specifies the words or phrases that can or cannot be used. For instance, this list can include commonly misspelled words and politically incorrect phrases. 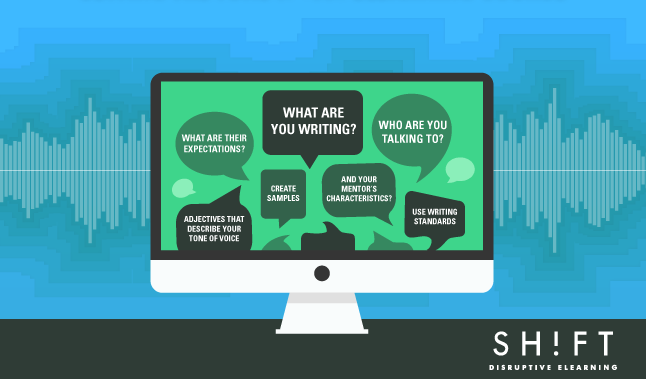 Finding and writing in the right tone of voice is critical because you want to touch a chord in your audience. You want your course to read and sound natural to them, so they don't feel alienated.